Sweet Basil Ocimum Basilicum is one of the most recognizable herb plants that can be easily grown from Basil seeds. Sweet Basil is bushy, annual plant that grows 1 to 2 feet tall featuring foliage with large, shiny green leaves and floral spikes covered with very small white flowers. Both leaves and flowers have wonderful fragrance, and blooming Basil attracts bees and butterflies all summer long. Sweet Basil is terrific as an ornamental herb for a home garden or as a potted plant for growing indoors as well as outdoors. Ocimum Basilicum seeds can be successfully germinated even by a beginning gardener. The growing Basil plants prefer full sun, rich, well-drained soil and regular watering. Although Sweet Basil is commonly used in Mediterranean pesto and pesto-based recipes, Basil is also one of the important ingredients of several Asian cuisines. 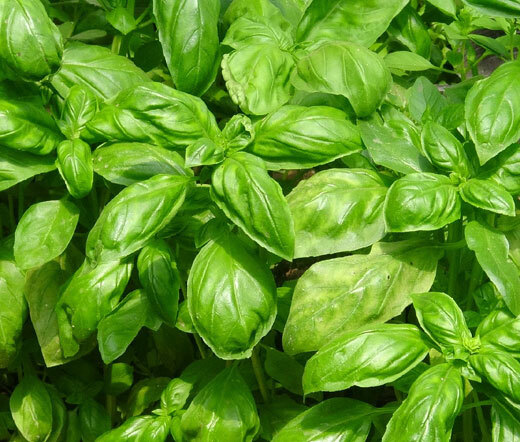 Basil leaves, flowers, and seeds and enhances the flavor of many different dishes, such as spaghetti sauce, pizza sauce, ratatouille, salads, meet and fish dishes.